Above: Daje Shelton in “For Ahkeem,” a documentary film directed by Jeremy S. Levine and Landon Van Soest. The film tells the intimate and frank story of Daje Shelton, a strong-willed Black 17-year-old girl in North St. Louis, Missouri. The audience walks beside her as her path takes her from public school expulsion to the court-supervised Innovative Concept Academy, an alternative school for delinquent youth and her last chance to earn a diploma. Shot over a two-year period against the charged backdrop of nearby Ferguson, we witness Daje’s struggles as she copes with academic rigors, the murders and funerals of friends, teenage love and a pregnancy that results in the birth of a son, Ahkeem. With motherhood comes the realization that she must contend with raising a young Black boy in a marginalized neighborhood. The film illuminates the challenges that many Black teenagers face in America today, and witnesses the strength and resilience it takes to survive. “For Ahkeem” will screen on Sunday, November 26 at 4:30 p.m. at The Cabot Theatre, 286 Cabot Street in Beverly as part of a special Salem Film Fest Presents — the documentary fest’s first cinema presentation outside of Salem. Levine will be on hand at to answer audience questions at the post-screening Q&A. Salem Five Charitable Foundation is underwriting the screening and three local organizations are community partners: The Beverly Human Rights Committee, First Church Salem, UU and Salem No Place for Hate. For Levine, who attended Beverly High School and worked for years as a counselor at the Waring School, the film he co-directed is more than a simple coming-of-age story. “It highlights the horrible effects of the school-to-prison pipeline, where we suspend and expel huge numbers of students — especially black and brown students — and the impact that has on girls like Daje from the time they’re five-years-old,” he said by phone from New York City, where he and co-director Landon Van Soest run Transient Productions, a full-service production company. The film also approaches some of the most pressing social challenges facing America today — racial bias, social inequality, public education, police brutality and a biased criminal justice system. “We wanted to tell a deeply personal story about what it means to live your life when so many systems are set against you,” Levine, an Ithaca College alumnus with a degree in Documentary Studies, said. “For Ahkeem” has had an award-winning festival run starting in February at the Berlin Film Festival, followed by prestigious showcases like the Tribeca Film Festival, Canada’s Hot Docs, and the DMZ International Film Festival in South Korea. While the film’s worldwide audience and awards —such as the Grand Jury Prize Award at Boston’s Independent Film Festival — thrill Levine, for him the screenings and discussions at high schools and prisons fulfill a greater mission of trying to do better for future generations of children. In Tribeca, New York City, for example, approximately 500 high school students attended a screening. “When Daje came out for the Q&A afterwards, the kids erupted in applause,” Levine said. The ensuing discussions included kids “really opening up about some of the challenges they face in their lives. It was really incredible,” Levine added. He is currently working to bring the film to more public high schools through a grant program. Screenings at prisons have been equally powerful. When the lights came up at one screening for 100 inmates, all the tears in the room full of men touched Levine. “One of them wrote a poem for Daje and Ahkeem. Another man said, ‘Who knew I could learn so much about being a man from the story of a young woman?’” he said. Levine credits the culture of Judaism and Hebrew School lessons at Temple B’nai Abraham in Beverly, “a part of my life growing up”, with imbuing in him a sense of responsibility to try to make the world a better place. “I learned about the long suffering of our heritage and the injustice of that. That kind of moral underpinning is definitely huge in the work I do,” he said. “For Ahkeem” will screen on Sunday, November 26 at 4:30 p.m. at The Cabot Theatre, 286 Cabot Street in Beverly as part of a special Salem Film Fest presentation. For more information or to buy tickets, visit theCabot.org. 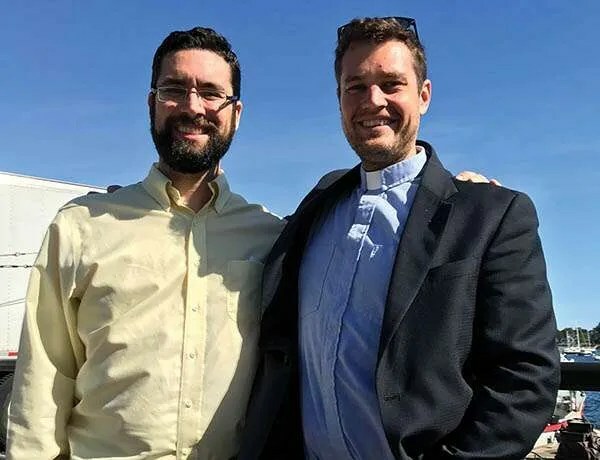 When Temple Sinai’s Rabbi David Cohen-Henriquez and Pastor Jim Bixby from Clifton Lutheran Church first met at a Marblehead Ministerial Association meeting last summer, they both sensed a spiritual connection that went beyond them being among the youngest in the room. Bixby, who congregants call “Pastor Jim,” grew up in Miami next door to many Panamanians, and he was fascinated when he found out Cohen-Henriquez was born in Panama. “I said to myself, ‘I don’t think I know anyone from Panama who is Jewish, let alone a rabbi, let alone a man with a hyphenated last name and a gift for storytelling,’” Bixby said with a chuckle. The two spoke at length and realized their connection ran deeper than congregational size and demographics. Both aspired to engage their communities into social action while connecting personally and spiritually with their neighbors of different faiths. Bixby learned of Temple Sinai’s decision to focus its social action on homelessness and of its support for Lynn shelters. He shared his church’s emphasis on helping recently arrived refugees and immigrants at Lynn’s New American Center. With both congregations committed to providing food for marginalized people in need in Lynn, the two spiritual leaders decided to combine forces. The result is “The Manna Project,” a joint mission with three components: a pulpit exchange, a Harvest Festival, and a food-packing event to benefit the needy in Lynn. The September pulpit exchange was a huge success. Bixby addressed a Friday night Shabbat service and Cohen-Henriquez spoke at a Sunday morning church service. Both events drew congregants from both communities and thrilled the two clergymen. Cohen-Henriquez had been in churches before, but had never been to a Sunday service, and certainly had never spoken to a congregation from a Christian pulpit. The similarities between the two traditions impressed him. The Lutheran selected reading (similar to the weekly Torah parsha) during his appearance happened to be about the crossing of the Sea of Reeds, known to Jews as the parting of the Red Sea. He captivated the churchgoers with midrashim that retold familiar biblical stories in ways outside the traditional Lutheran framework. “Seeing people react to these stories that fill in the blanks, appreciating and rediscovering treasures that were already there, was really satisfying,” Cohen-Henriquez said. The communitywide Harvest Fest, timed to coincide with the end of Sukkot and Oktoberfest, was a fund-raiser with vendors, games, and food, which both communities prepared and sold together. Shepherded by Temple Sinai Executive Director Susan Weiner, and Clifton Lutheran Church UpReach Council member Pat Small, the event raised $2,000 toward its $5,000 goal. Each dollar raised buys a meal for a family of four. To fill the fund-raising gap, The Manna Project will sell tickets for a monthlong daily raffle in January. Bixby and Cohen-Henriquez went to local Marblehead businesses soliciting donations. (“Seeing a pastor and a rabbi entering your store must be like the opening of a joke,” Cohen-Henriquez said with a laugh). Both were struck by how generous the business owners were and by how much they appreciated seeing clergy from different traditions work together. The Manna Project’s third and capstone event is a food-packaging gathering on March 4, which will involve both communities’ social action committees and many volunteers. “We will need as many hands on deck as possible in order to get out the 3,000 to 4,000 meals we hope to prepare. Many hands make light work!” said Small. In the meantime, both the pastor and the rabbi are positive their collaborations will not end with The Manna Project. “Our communities are getting to know each other. We even see our missions as intertwined,” Bixby said. For more information on The Manna Project, call Temple Sinai at 781-631-2763 or Clifton Lutheran Church at 781-631-4379. 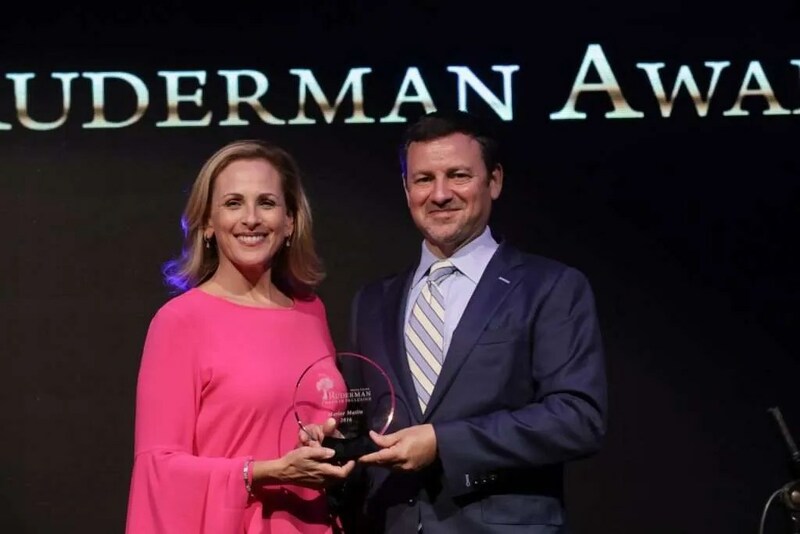 Above: Jay Ruderman, president of the Ruderman Family Foundation, presents Oscar-winning actress Marlee Matlin with the Morton E. Ruderman Award in Inclusion in Tel Aviv earlier this year. NOVEMBER 2, 2017 – Over 1,000 attendees will have the opportunity to hear 50 speakers address ways to open doors for people with disabilities when the Ruderman Family Foundation holds its 2017 Inclusion Summit at the Seaport Hotel & World Trade Center in Boston on Nov. 19 and 20. Among those who will appear are disability activist Marlee Matlin, a Jewish performer who is the only deaf film star ever to receive an Academy Award for Best Actress in a Leading Role for 1986’s “Children of a Lesser God;” Senator Maggie Hassan of New Hampshire; Richard Marriott, chairman of the Marriott Foundation for People with Disabilities; and Joyce Banda, former president of Malawi. “These are people who spend time and effort trying to change their community,” said Jay Ruderman, president of the Ruderman Family Foundation. For over a decade, the foundation’s philanthropic mission has emphasized both advocacy for the inclusion of people with disabilities worldwide and educating Israeli leaders on the American Jewish community. This is the second Inclusion Summit, and Ruderman expects the conference to sell out. Although the foundation – which has offices in Boston and Israel – has a global reach, it has invested more than $20 million in strategic multiyear initiatives in the Metro Boston area. These programs touch the lives of people of all ages with all types of disabilities. On the North Shore, Temple Sinai in Marblehead and Congregation Shirat Hayam are partners in the Combined Jewish Philanthropies/Ruderman Synagogue Inclusion Project, which helps create religious communities where people of all abilities can fully participate. The Jewish Community Center of the North Shore also partners with the foundation to offer a year-round early childhood education program and an inclusive summer camp that makes a fun experience available to both campers and staff with disabilities. It doesn’t stop there. The foundation’s partnerships with CJP and Newton-based Gateways: Access to Jewish Education provide opportunities for children with disabilities in kindergarten through grade 12 to receive a Jewish education in an inclusive community. The Morton E. Ruderman scholarship helps defray the cost of both school-based and ancillary services for students with physical and emotional challenges. The goal of both programs is to mainstream students with disabilities in Jewish educational programs. High school students benefit from a number of Ruderman Family Foundation partnerships. Student-athletes with visual or mobility impairments can participate in high school sports across eight states through the Northeast Youth and High School Inclusive Sports Initiative, a joint program with Adaptive Sports New England. New England Yachad and the foundation sponsor high school clubs, a youth leadership board, and a Jewish youth group network that provide opportunities for participants with and without disabilities to attend retreats, leadership training, and meetings. Young adults with disabilities can receive training and job placement though Transitions to Work, a partnership among the Ruderman foundation, CJP, and Jewish Vocational Services. Since 2011, 200 individuals have graduated from the program. Of the 72 percent who achieve competitive employment, over 90 percent stay at their jobs for at least one year. Partnerships with the Boys & Girls Clubs of Boston and Dorchester; Brookline Community Mental Health Center; Mass. General Hospital; and the Boston Jewish Film Festival all further the foundation’s mission: inclusion of children and adults with disabilities as a social justice imperative. Jay Ruderman feels strongly that bringing public attention to injustices suffered by people with disabilities is critical to starting a public debate. His family’s foundation’s current strategy of developing a strong advocacy presence is aimed at raising the general public’s awareness. “We recognize that our grantees are excellent at providing services, but to change minds, and ultimately to change social attitudes, we also need advocacy,” he said. All this activity and global impact is the outgrowth of the belief and commitment of foundation founder Morton E. Ruderman that disability rights are civil rights. When Jay Ruderman contemplates how far the foundation has come since it was established in 2002, he thinks his father, who died in 2011, would be surprised. “We started out as a foundation that was really focused on the Jewish community in Boston, and now we’ve expanded to having worldwide reach. I think he’d be proud of that,” he said. For more information or to register, visit inclusion2017.org. NOVEMBER 2, 2017 – SWAMPSCOTT – About five years ago, Deahn Berrini and her family were enjoying dinner at their Swampscott home. Her son, knowing of her interest in Native American people, mentioned that researchers had just discovered a clue to the lost colony of Roanoke Island, off the coast of North Carolina. “I said, ‘That could be a good story.’ And then my son said, ‘Hey, mom. You could write that,”’ said Berrini, the daughter of an Air Force father, who was born in Wiesbaden, Germany. A member of Temple Emanu-El in Marblehead, she grew up in Ipswich and attended Brown University, where she majored in history, and Boston College Law School. When her son brought it up, she found herself drawn to that unsolved puzzle of the mysterious disappearance of 115 British men, women, and children in 1587. Once she started her research, she knew she wanted to write the story, but not from the colonists’ point of view. Some have speculated that Native Americans attacked and killed the English colonists. Others theorize they tried to return to England and were lost at sea, or might have been killed by Spaniards who came north from Florida. One theory suggests the settlers were absorbed into friendly Native American tribes. When Berrini approached the story from the point of view of the people who were already there – the Croatoan Native American tribe – her heart and her imagination followed. “The characters came to me fully formed,” she said. Four years and three rewrites later, Berrini hopes to change that with the publication of her third historical novel, “A Roanoke Story,” on Nov. 30. She will launch her book tour by reading from and discussing the book at the Swampscott Public Library from 7 to 9 p.m. on Monday, Nov. 13. 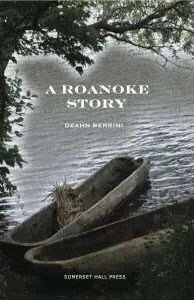 In addition to broadening our understanding of history, Berrini also sees a clear connection between “A Roanoke Story” and the abiding Jewish tenet of social justice. As head of Temple Emanu-El’s social action committee for the past five years, she has championed shedding light on unfairness and untruths. The Swampscott Public Library is at 61 Burrill St.
For more information, visit swampscottlibrary.org or call 781-596-8867.